You are looking at SDC-25-2005 by Hydronix Water or Equivalent. Pack of 6 in a box of the following: 5-micron Polyspun Filter Cartridge 2.5"x20"
2.5" diameter and 20" long polypropylene Sediment Filter Cartridge with 5 micron rating. 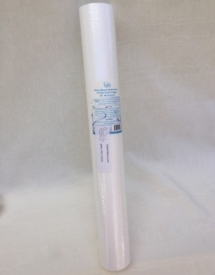 Melt Blown polypropylene (PP) 5-micron sediment filtration cartridge. The 2.5�x20� cartridge has low pressure drop (i.e., 0.4 psi for 2 gpm flow), high chemical resistance and high dirt-holding capacity. It traps sediments, dirt and rust and any other particulate/suspended matter larger than 5 microns. Melt Blown PP filters are constructed as multi layers for true depth filtration. The graded density construction captures particles throughout the entire cross section of the cartridge and reduces surface binding. It is a necessary element for the protection of the elements that comes later (e.g., carbon cartridge or reverse osmosis membrane) in any 20� water filtration system. Removing sediments will improve the appearance and the taste of water. This cartridge is used as Stage 1 in many drinking water systems including the 20� filter systems (e.g., FS3-2038). The filter cartridge is shrink wrapped for extra protection during storage and handling.